Phoenicia's Davy Crockett statue, to be officially re-erected in front of Mystery Spot Antiques. King of the wild frontier, congressman, town icon—Davy Crockett is turning 227 this year, and Phoenicia is celebrating by re-erecting the statue of the frontiersman on August 17. The official ceremony will unveil the 10-foot figure in all its glory in front of Mystery Spot Antiques. This fiberglass replica of Crockett has had a history almost as arduous as its real-life bygone counterpart. It's uncertain who the statue's sculptor was, though local historians agree it was probably commissioned by a previous owner of The Sportsman's Bar in the '70s. Since then, the gentle giant was extensively vandalized in 2003, repaired by the bar's current proprietor, Mike Ricciardella, and then taken down again after a flood caused by Hurricane Irene. Now, the statue will find a new home outside of the antique store, where people can get a closer look at the raccoon-hatted Alamo soldier. Take this opportunity to break out your own imitation coonskin cap or buckskin breeches for the Davy Crockett lookalike contest, which takes place right after the official ceremony. Kids, adults, and even pets can enter, and the winner will walk away with a $100 gift certificate to Mystery Spot. Runners-up can earn coupons to other local businesses, like Tender Land Home and Mount Tremper Arts. 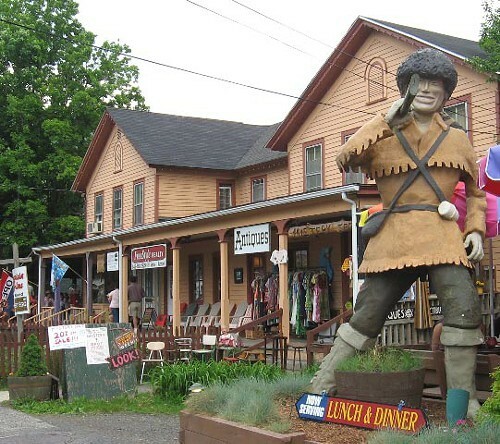 Later, grab some refreshments from the Sportsman's Alamo Cantina and listen to the Catskill Ukulele Group's performance of "The Ballad of Davy Crockett"—and of course, don't forget to take a picture with the statue itself. For more information, visit Mysteryspotantiques.com.